Embark on the Central Arnhem Road, starting just south of Katherine. Discover serene beauty, tranquil seas and vast woodlands. This four-wheel drive adventure will leave you understanding why Arnhem Way is considered one of Australia’s last unspoilt areas. 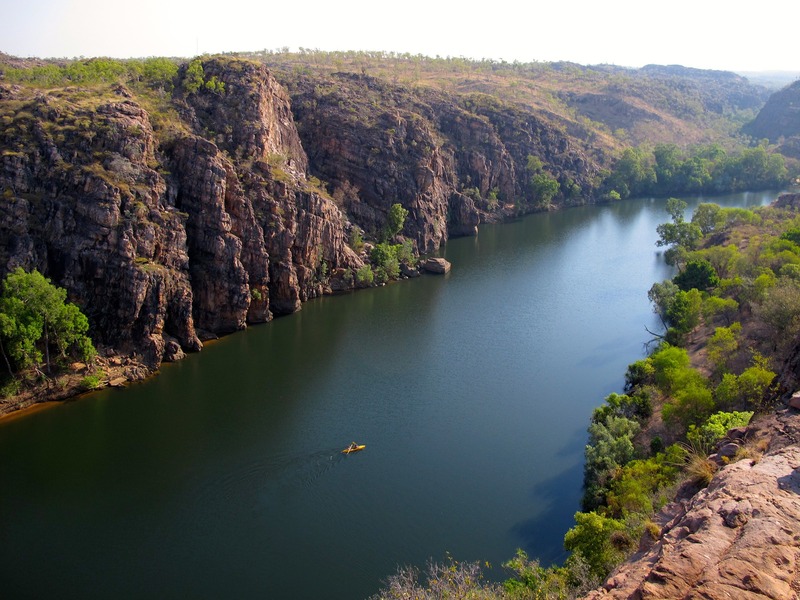 Start your journey in Katherine, the Northern Territory’s third-largest town, where the banks of Katherine River flow into the stunning Katherine Gorge in Nitmiluk National Park. This vast gorge can be explored however you fancy: canoe, cruise, bushwalk or take a scenic flight and experience this beauty from a high. If relaxation is what you’re after, Katherine has you sorted, with the Katherine Hot Springs located on the banks of the Katherine River, just five minutes from town. If history is more your thing, immerse yourself in the heritage of the area by visiting some of the museums on offer. Katherine Museum houses Aboriginal artefacts from the region, as well as a range of photographs, furniture and tools from the late 19th to mid 20th centuries. Be sure not to miss the Larrimah Museum, located near the town’s old railway yards, where you can learn all you’d ever want to know about the railway operations in World War II beyond. Next, make your way to Mainoru Store, 250 kilometres north east of Katherine. This drive will showcase even more of the breathtaking scenery that the Katherine region has to offer. On the way, stop off at Cutta Cutta Caves Nature Park. This vast park covers 1499 hectares of karst limestone landscape, get out and stretch your legs at the Tropical Woodland walk which begins near the car park and takes a breezy 10–20 minutes to complete. The iconic Mainoru Store is known as the only fuel stop between Katherine and Nhulunbuy, so be sure to stock up on the necessities before hitting the road again. At the end of this journey, you will find yourself in Nhulunbuy, on the Gove Peninsula. Here you can truly immerse yourself in the laid-back and relaxed lifestyle of tropical Nhulunbuy, and enjoy a cultural experience in what is widely considered one of Australia’s last strongholds of traditional Aboriginal culture. The pristine waters of the Gove Peninsula will likely tempt those with fishing on the mind. Getting your own boat to Nhulunbuy is difficult, but the locals have you sorted with charter vessels and guided fishing tours available around the Gove. After a long day, you’ve earned your dinner, so treat yourself to a visit to the Gove Boat Club – you won’t know what’s better, the food or the sunset!